Bochdalek hernia (BH) rarely presents in adults. It is one of the most common types of congenital diaphragmatic hernia (CDH)., Usually BH is detected in neonates because of respiratory distress, while in adults it can present asymptomatically on incidental radiology investigations or it can also present with complications. Surgical repair is recommended in all adult patients with CDH whether symptomatic or not due to potentially fatal complications. The recurrence of repaired BH is even rare. The case presented here depicts the survival of a failed correction of BH in infancy, which persisted into adulthood. 61-year-old female, a known patient of CDH, came with complaints of breathlessness on an exertion of Grade 2 severity, which worsened with heavy meals along with difficulty in passing gas. She noticed that sometimes lying down flat on the left lateral position helped her move gases. She was detected with BH at the age of 4 months following investigations for failure to thrive and recurrent vomiting. She underwent repair of the BH, which was complicated by a postoperative infection of the left pleural cavity and infected intercostal drain. However, the patient ultimately made full recovery. One chest X ray taken for episode of fever 13 years after surgery showed persistence of CDH. The patient did not opt for any surgical intervention due to tolerable symptoms at that stage. She could tolerate two full-term pregnancies delivered by caesarean section without any intrapartum complications during her clinical course. The patient observed that smaller meals and restricting her physical work would give her fewer symptoms. Therefore, she modified her lifestyle accordingly and continues with her daily life. In her physical examination, pulse was regular at 90 per minute, respiratory rate was 20 per minute, blood pressure was 146/84, and oxygen saturation was 93% in room air. There was a surgical scar from the previous surgery over her left lower axilla and the left hypochondriac region. On auscultation of the lungs revealed poor breath sounds on the left hemithorax with occasional peristaltic sound heard. Heart auscultation was normal. On clinical examination, there was no evidence of any other congenital anomaly. Other systemic examinations were unremarkable. 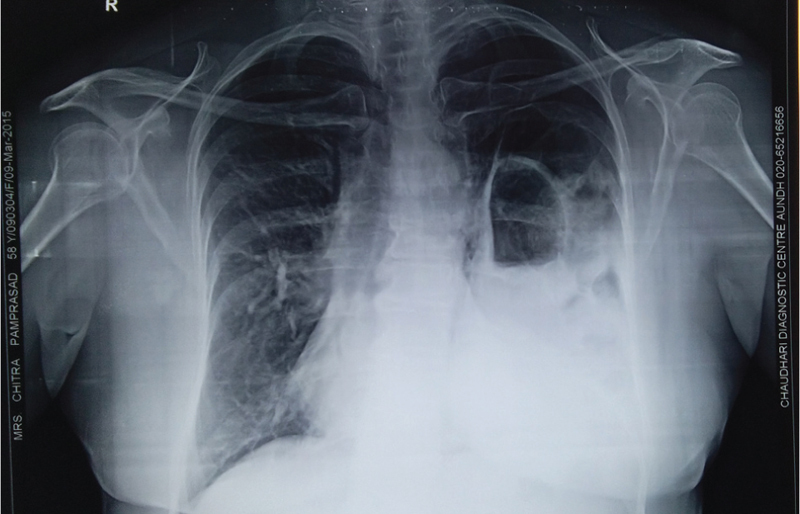 Chest X Ray postero anterior view [Figure 1] showed large intestinal loops in the left hemithorax with a shift of the mediastinum to the right side. A computed tomography (CT) scan [Figure 2] of the thorax confirmed the presence of a large Bochdalek diaphragmatic hernia with stomach, small and large intestine in the left hemithorax. There was mild restrictive defect on pulmonary function test. The distance for a 6-min walk test was 399 m. 2D Echo findings were normal. We discussed the possibility of bowel strangulation as a potential complication and recommended surgical repair for the patient, which was refused by the patient. A major portion of the diaphragm develops from the septum transversum, the pleuroperitoneal membrane, and the mesenchymal rim of the chest wall. The two crura of the diaphragm originate from the mesentery of the esophagus. The herniation of the abdominal contents into the thoracic cavity occurs through this defect resulting in diaphragmatic hernia when all these structures fail to correctly align during the development of the diaphragm in utero. BH is the result of an incomplete closure of the left pleuroperitoneal canal causing defect in the posterolateral part of the diaphragm. The reported incidence of BH is about one in 3000 live births. Unfortunately, mortality rates in infants remained high despite advanced neonatal intensive care with surgical repair. Few CDHs may escape detection in infancy and childhood mostly due to the smaller size of hernia or cardiorespiratory compensation in some patients. The survival of patients with CDH hinges not only on the size of the hernia but also on the presence of other congenital abnormalities such as pulmonary hypoplasia, pulmonary hypertension, and other anatomical abnormalities, which are associated with BH. Our patient had no other congenital anomaly. An asymptomatic incidental detection of BH on radiological investigations is observed frequently. Rarely, Bochdalek diaphragmatic hernia presents in adulthood with symptoms. When symptomatic, it presents with respiratory and gastrointestinal symptoms in adults. The description of worsening respiratory symptoms with meals can be reported by patients with BH. It is presumably due to the movement of bowel, gas, or the filling of the stomach and intestine triggered by food. Respiratory symptoms occurring in combination with gastrointestinal symptoms with abnormal shadows on CXR should arouse the suspicion of BH. The patients with BH are at a risk of gastrointestinal complications such as intestinal obstruction, strangulation, and acute abdominal emergencies. Few case reports describe presentation, which varied from minor respiratory difficulty up to a more severe presentation of type 2 respiratory failure. In case of emergency, if the possibility of BH is not kept in mind, it may mislead the clinician toward other possibilities such as tension pneumothorax or hydropneumothorax. The case described herein, to the best of our knowledge, represents a rare case of large Bochdalek diaphragmatic hernia, which recurred after failed repair and persisted into adulthood. Further, the patient could complete two full-term pregnancies without intrapartum complications. The patient modified some aspects of her lifestyle such as eating a small quantity of meal and avoiding strenuous physical activity to carry on with life. She refused surgical repair. She practices yoga to improve her respiratory performance and spiritual practices to augment her well-being. Recurrence after the repair of BH is rare. According to one study, it was 1.6%. Possible reasons described for recurrence include use of absorbable sutures, displacement of mesh used for repair, postoperative paralytic ileus giving rise to increased postoperative abdominal, and intra-abdominal sepsis, which may also be the reasons described for failure to close the diaphragmatic defect. Pansini G, Pascale G, Pigato I, Malvicini E, Andreotti D, Caruso A et al. 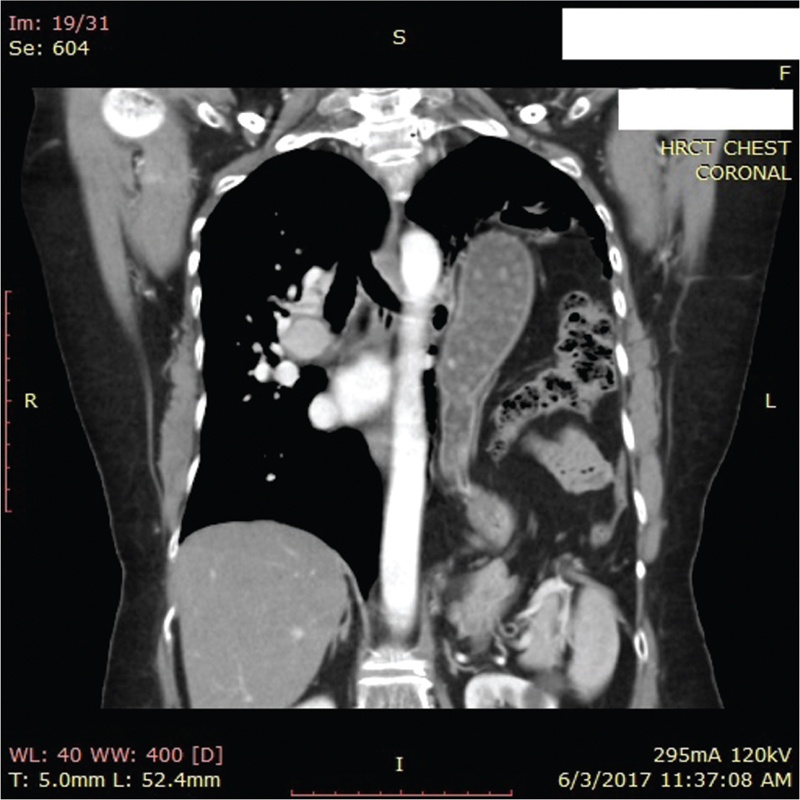 A rare diaphragmatic hernia with a delayed presentation of intestinal symptoms following spleno-distal pancreatectomy: A case report. J Surg Case Rep 2017;2017:rjx135. Amer K. Thoracoscopic approach to congenital diaphragmatic hernias in adults: Southampton approach and review of the literature. J Vis Surg 2017;3:176. Hung YH, Chien YH, Yan SL, Chen MF. Adult Bochdalek hernia with bowel incarceration. J Chin Med Assoc 2008;71:528-31. Golombek SG. The history of congenital diaphragmatic hernia from 1850s to the present. J Perinatol 2002;22:242-6. doi: 10.1038/sj.jp.7210701. Machado NO. Laparoscopic repair of Bochdalek diaphragmatic hernia in adults. N Am J Med Sci 2016;8:65-74. Erhardt A, Aker S, Saleh A, Hennersdorf M, Gross-Weege W. A seropneumothorax? Lancet 2002;359:578. Sathyanarayana N, Rao RM, Rai SB. An adult recurrent diaphragmatic hernia with a near complete defect: A rare scenario. J Clin Diagn Res 2012;6:1574-6. Mullins ME, Stein J, Saini SS, Mueller PR. Prevalence of incidental Bochdalek’s hernia in a large adult population. AJR Am J Roentgenol 2001;177:363-6.